And, for a limited time, we’re releasing an exclusive guide of tips (and closely-guarded secrets!) to help YOU live younger at any age... ABSOLUTELY FREE. 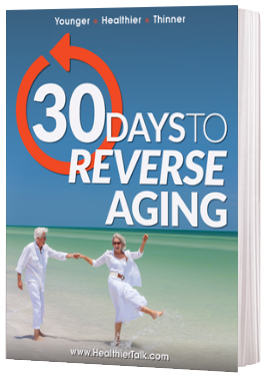 When you RSVP for your guide today, you’ll have immediate access to The 10 Secrets of People Who Beat the Aging Game, PLUS receive a FREE copy of Younger, Healthier, Thinner – 30 Days to Reverse Aging your comprehensive blueprint to turning back the clock – inside and out. Recapture the vision of your youth. Toss the granny glasses and bring back your teenage eyes with these 11 vision-boosting nutrients. page 20. Take YEARS off your appearance. A breakthrough has been proven to reverse your body’s aging process by rebuilding, old, damaged cells. Most people notice results within THREE weeks. Learn what it is and how to get your hands on it on page 24. Stay healthy and wise to 100 and beyond. Discover the “antidote to aging” that helps to protect your heart, supercharge your brain, sharpen your vision, and so much more. Page 12. PLUS! The breakfast “treat” that could literally halt aging. Prevent or even reverse the devastating diseases of aging with this delicious recipe. All the details on page 10. Whether you’re in your 50’s, 60’s, or even 70’s… you CAN look younger, get leaner, and feel smarter – starting TODAY. And now, as part of a select group, we’d like to share this impressive resource with you as an absolutely FREE GIFT. You won’t find any “bill me later” gimmicks or hidden charges here… all we ask is that you give our free e-newsletter, Healthier Talk, a try. Simply enter your email address below to get started, and we’ll immediately deliver your free gift. Our research and commitment to you doesn’t end here. Healthier Talk will keep you updated with other valuable natural health tips, but if you’d ever prefer to unsubscribe—just let us know.